Orders greater than the values below in your region will qualify for free shipping. Select Thickness 1/8" 3/16" 1/4" 3/8" 1/2"
45 Degree Bevel with Polished Edges ? Round Over on Top Surface with Polished Edges ? Round Over on Top & Bottom Surfaces with Polished Edges ? Radius Corners with Polished Edges ? 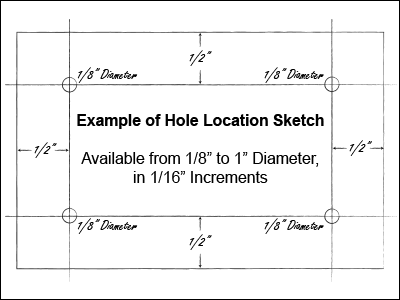 Select Corner Radius 1/2" 3/4" 1" 2" 3" 4"
A dimensioned drawing or sketch with hole placement is required. Please indicate hole position as the distance from the center of the hole to the sheet edge. Please note that hole edges are not polished. You will receive an email with further instructions upon receipt of your order. There is a minimum order quantity of units. Please check your selection. 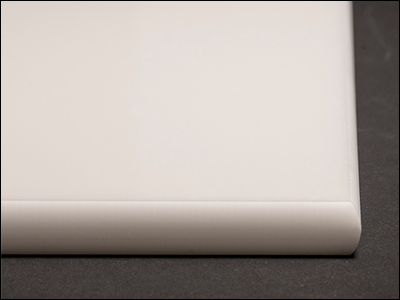 Choose from the options above to order custom cut-to-size White Cast Acrylic Sheets. Acme Plastics has a broad selection of stock sizes available. This option allows you to select just the size and dimensions you need without the need to purchase and store excess materials. After dimensions are selected an updated price per custom sheet will be displayed. 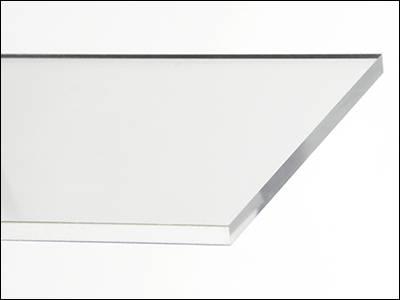 We offer a variety of customization options and edge polishing methods for our acrylic sheets. For a glossier edge select an option with polished edges. 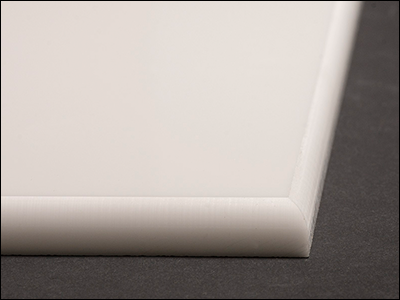 Soften the edges of your acrylic sheets with beveled or rounded edges or radius/rounded corners. Have additional questions about any of these options? Contact our team at Acme Plastics for more information on our acrylic edge polishing and finishing options. You can choose to add holes to your acrylic sheet. After entering your desired number of holes, select from available hole sizes using the drop down menu above. Standard Cut-to-Size length and width tolerances are +/-1/8", but are typically more accurate. Please contact us if you need greater precision. Acrylic sheet thickness tolerances are +/- 10% and can vary throughout the sheet, but variations are typically less than 5%. Please refer to nominal and actual sheet thicknesses below. 1/8" = 3mm = 0.118"
3/16" = 4.5mm = 0.177"
1/4" = 5.5mm = 0.217"
3/8" = 9mm = 0.354"
1/2" = 12mm = 0.472"
Cut-to-size products are CUSTOM and therefore NON-RETURNABLE. Cast Acrylic is moisture resistant and half the weight of glass but 17 times stronger. Cast acrylic has a higher molecular weight than extruded acrylic, making it a better choice for shaping, machining and laser cutting. Common uses for Cast Acrylic are signage, aquariums, POP displays and furniture. 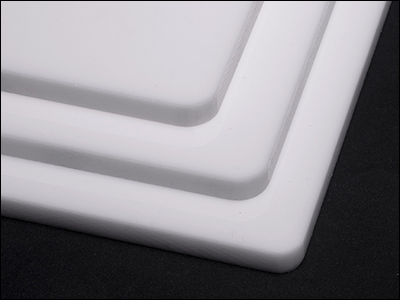 Acme Plastics' Acrylic Cast White Sheets come in 3 shades of white; 2447 is translucent dull white, 7328 is translucent bright white and 7508 is opaque bright white. 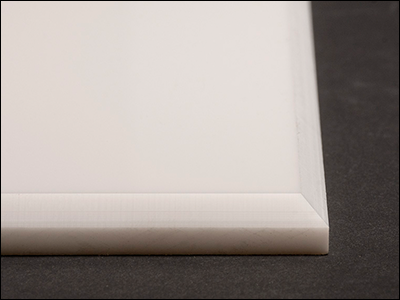 Acrylic Cast White Sheets are available in many thicknesses and sizes. Acme Plastics has Cut-to-Size. Acrylic Cast White Sheets. I am interested in placing an order for Cut-to-Size White Acrylic Sheet - Cast. Your one stop plastics center for any brand, any shape, any product. Acme has a proud heritage of customer service and reliability since 1943. Our expansive warehouse and manufacturing facility combined with experienced personnel assure that you receive the service and prices that you deserve. Remember, if it's plastic it’s at ACME PLASTICS.